This article is an effort to document characteristics of some of the known prototypes of the Remington 51. Six prototypes are in the collection of J.B. Cargile, who has very kindly allowed me access to them. The definitive early sources of information and history on Remington Model 51 prototypes are two articles by Donald M. Simmons, Jr., one in the 1979 Gun Digest entitled “The Remington Model 51,” and a later article in the May/June 1982 issue of Man at Arms entitled “The Remington Model 51 Prototypes.” At the time of writing of Simmons’ first article (probably 1978), Mr. Simmons was only aware of three prototypes: one was in the collection of Mr. Sidney Aberman of Philadelphia, one was owned by Mr. Simmons, and the third was a cutaway model at the Remington Arms Company. In the second article, Mr. Simmons gives details about several other prototypes, including a .32 caliber prototype, a .380 prototype with an external hammer, a late prototype stamped with serial number 545 which was in the Wells Fargo Museum, and an early production gun with serial number 312, making a total of seven prototypes he was aware of in 1982. Mr. Aberman’s gun is now in the J.B. Cargile collection, along with another early .32 prototype and four other .380 prototypes. Mr. Cargile also has a cutaway .380 in his collection that differs from the one at Remington--it appears to be a cutaway of a production gun, and has a serial number on the top of the slide. I do not know what became of the prototype that was in the possession of Mr. Simmons, but his description of it leads me to believe it is very similar to other .380 prototypes in the Cargile collection. The .380 prototype with the external hammer is now in the collection of Mr. Charles Doty, as is serial number 545. Altogether, there are over a dozen known prototypes, and I suspect more will surface as gun owners are made more aware of their characteristics. In his article on the “Remington Model 51 Prototypes” Simmons discusses early, middle, and late prototype pistols as distinct from production pistols. He also discusses how the earliest prototype pistols differed from the original patent drawings. I will try to provide definitions for the three categories, though my definitions may not always parallel Mr. Simmons’ usage. The original patent drawings are very detailed, though a gun exactly like the patent drawings was probably never built. The patent shows a gun with an internal hammer, a grip safety, helical-cut barrel lugs (interrupted threads, as Simmons calls them), no manual safety lever, and no magazine safety. Grips in the patent drawings were held in place by dovetail grooves in the baked rubber which fitted into two overhanging sections on either side of the grip portion of the frame--the grips slid up and locked into place. Early prototypes were made when the gun was still very much in the planning stages. Early prototypes adhere closely to original patent drawings--they have helical-cut barrel lugs instead of the production pinned barrel, and have the original patented spring and plunger extractor design, which never appeared on a production gun. Early prototypes all lack the inscription on top of the slide and do not have riveted grips with the metal backplate. One gun which differs from the patent drawings but which is definitely an early prototype, is the external hammer model, which is absolutely unique. The only other guns with hammers were the .45 caliber M53 prototypes. Middle prototypes were made as the Model 51 approached production status, but final decisions had not yet been made on all issues--as I define them, they have pinned barrels like production guns, but may have other features that are intermediate between early design drawings and production guns, or they may have mixed features, some early and some late. not show a tail, but is otherwise identical to prototype breech blocks with tails. Interim Breech Block is like a production BB, with a shortened, built-in tail, except it has a cartridge guide lug. 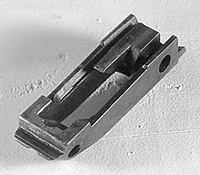 The cartridge guide lug was eliminated & a shorter tail became integral with the breech block body. Prototype Grip. Note back of prototype grip and overhangs in frame for locking it in place. Also note lack of magazine safety lever. Production Grip. Note metal plate on back of grip. Also note the shape of opening in the frame, and the magazine safety lever. I classify late prototypes as those with serial numbers, but which lack a magazine safety and/or have the ejector on the magazine. Additionally all the prototypes I have seen (early or late) have the cartridge guide lug on the breech block, and two of them have inscriptions on top of the slide. I define any gun that includes a serial number, a magazine safety, and the ejector in the frame as a production gun. Any gun that has a cartridge guide lug and lacks a magazine safety is a prototype, even if it has a serial number. Two features appear on all known prototypes: the cartridge guide lug opposite the extractor on the breech block, and its corresponding extra notch in the barrel. The extra notch in the barrel was retained on many early production guns, indicating that many barrels had already been made before the guide lug on the breech block was eliminated. One feature does not appear any known prototype: the magazine safety. Additionally, none of the prototypes I have examined have proof marks either inside or outside. The prototype breech block had a feature that did not make it into production guns--a removable tail that prevented the slide from snagging the top cartridge in the magazine when it was moving backward during recoil. This little piece, which easily fell out of the breach block when the gun was disassembled, made reassembly very difficult and was likely to get lost during cleaning. The tail does not appear in the patent drawings. Eventually, the slide and breech block were both redesigned and a shorter, thicker, fixed tail was added to the production breech block. Four .380 prototypes (including Mr. Simmons’) and the .32 prototype in Mr. Cargile’s collection have the removable tail. I have already mentioned that prototype breech blocks have a cartridge guide lug opposite the extractor, which does not appear on any production gun I have examined. The original extractor design, utilizing a spring tensioned plunger to activate the extractor, never appeared on a production gun but appears on three of the .380 prototypes (including the one owned by Mr. Simmons) and on the .32 prototype in Mr. Cargile’s collection. The other three .380s in the Cargile collection have standard production extractors, with a single flat spring. The extractor on the production .32s was a springless, cam-only design, quite distinct from the original and the production .380 designs. Pedersen’s original design for the Model 51 called for a barrel with helical lugs on the bottom that fitted into helical grooves in the frame. Three of J.B . Cargile’s prototype pistols are made this way, as was the prototype owned by Mr. Simmons. Several Browning-designed guns have locking lugs, but the lugs and grooves are not helical and the tolerances are not nearly so close as in the Pedersen design. These prototypes are so tightly fitted that they can be difficult to take apart if the slide is not positioned precisely, and particularly if the parts are well oiled--if Pedersen had stuck with this design I believe he would have had to make cuts in the front of the barrel to allow a better grip for twisting it out of its grooves in the frame (as Browning did on his pistols). According to Simmons, the prototype barrel bushings are threaded and can be removed with a special wrench, but without this wrench the barrels cannot be removed. Production pistols have the bushing swaged into place, but the barrels are removeable from the rear once the breach block and firing pin are taken out. The original design for the barrel called for a step at the muzzle a few thousandths of an inch larger than the rest of the barrel, allowing for a very tight fit in the bushing at the end of the slide. This step was retained in later barrels, but a series of concentric grooves was added behind it--these were required because with the pinned barrels it is necessary to pull the barrel out about a half-inch in order to lift the breech block out of its locked position on the frame when removing the slide. Early prototype grips are held on by dovetail grooves on a pair of overhanging sections on each side of the grips. Two of the .380 prototypes and both .32 prototypes are made this way, with no grip rivets. All production guns, and some prototypes, have a steel plate riveted to the back of the grips with a continuous overhang toward the front and a pair of overhangs in the rear. There are three different magazine release configurations. What I have always called the magazine release was actually designated the magazine lock. The magazine lock consists of three pieces, the magazine lock itself, the magazine lock spring, and the magazine lock follower, or release button. The early magazine release buttons were smooth, and the magazine lock itself fit closely against the button, as shown in the patent drawings from 1920. All but two of the prototypes in the Cargile collection have smooth magazine release buttons. Concentric rings or ridges were cut into the later buttons, and for production guns a groove was cut into the magazine lock to aid in removing the lock assembly. Some interim prototypes have ridges on the release button, but lack the groove in the lock itself. Serial number 545, at the Wells Fargo Museum, has the interim configuration, as does serial number 23 from the Cargile collection. However, serial number 312 has the production configuration, as does the .380 prototype with the brown grips in the Cargile collection. Simmons states incorrectly in his 1979 article that “...no prototypes have the characteristic matted top surface between the sights...,” but I think this is a typo. I believe he meant his sentence to read: “Although all prototypes have the characteristic matted top surface between sights, there are no markings in this area, as are found on all production guns.” All the prototypes I have encountered (including the Aberman prototype examined by Simmons) have the matted top surface. Six are not engraved with the company name and patent information, though two are so engraved. Copyright 2007-2010 by Ed Buffaloe. All rights reserved.